Launchpage.org is an aggressive browser hijacker that has been bugging users for years. Unfortunately, it proceeds of doing so by infiltrating Macs and Windows with the help of software bundling, displaying fake search results, rerouting to suspicious sites, and tracking users' anonymous information about their browsing habits. 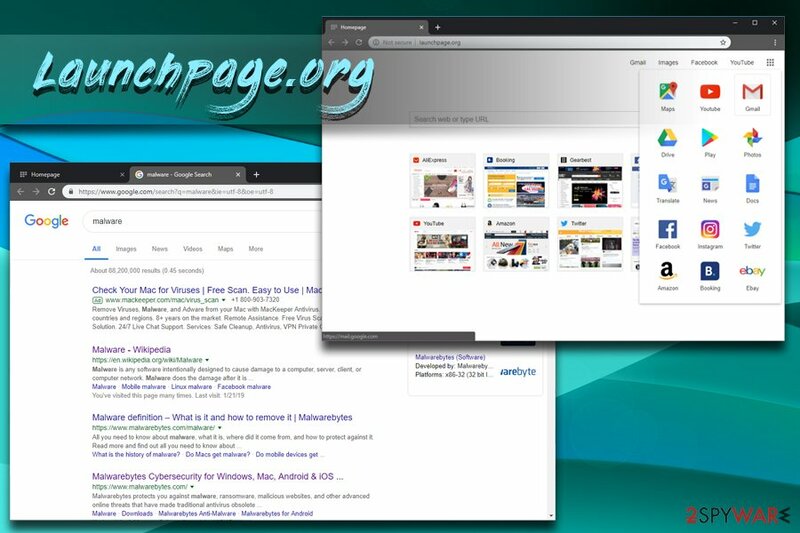 Launchpage.org hijacks and changes settings of Google Chrome, Internet Explorer, MS Edge, Mozilla Firefox, Safari, or another browser, and tries to mimic the world's most common search engine Google.com. The visual similarity is constructed for a reason – some users might not even pay attention to the changed browser settings and keep the PUP installed. However, Launchpage.org presence on the computer might compromise users' online safety and prompt the installation of malicious software. 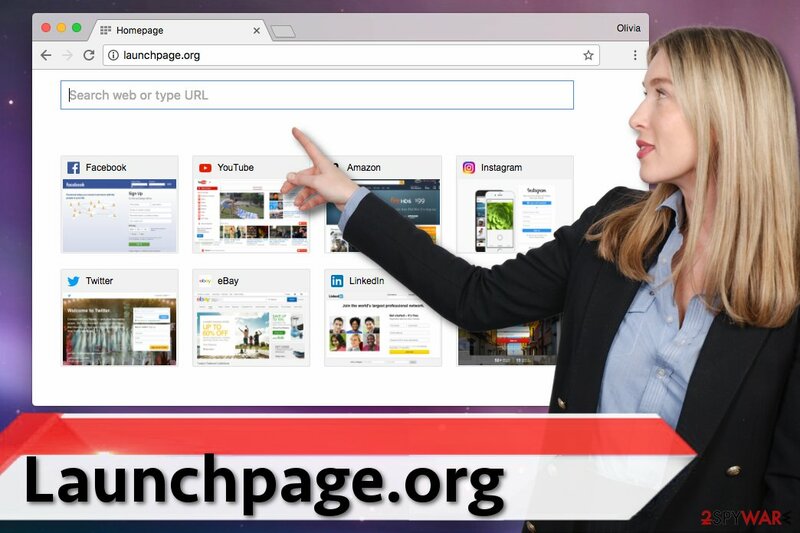 As soon as Launchpage.org virus gets into the system, it can input hxxp://launchpage.org/ value into your homepage, the default search engine, and new tab page settings and then start causing unpleasant URL redirects on your browser. The PUP is programmed to redirect to vivid third-party websites, such as weevah2.top, or other malware-related domains. In the beginning, Launchpage.org only targeted Chrome and Firefox users, and now it plagues Internet Explorer, Safari and Opera browsers. Changing the settings manually turns out to be futile in battling the hijacker. What is more, the PUP exhibits certain immunity to detection of malware detection. It tries to occupy users', despite whether they are Chinese or UK users, browsers. Nonetheless, since launchpage.org has been on the Web for a while, updating your security tool might help it to identify it. Due to specifications of certain browsers, users also complained not being able to delete the hijacker. In any case, if you have been struggling with Launchpage.org removal browser infection, check all the manual removal guide below. The deceptive appearance of Launchpage.org browser redirect virus typically makes victims think that it is the genuine Google start page. At the moment, it offers links to Gmail, Facebook, YouTube, and other popular social networks, and, if you click the menu in its top right corner, you can find other popular services. 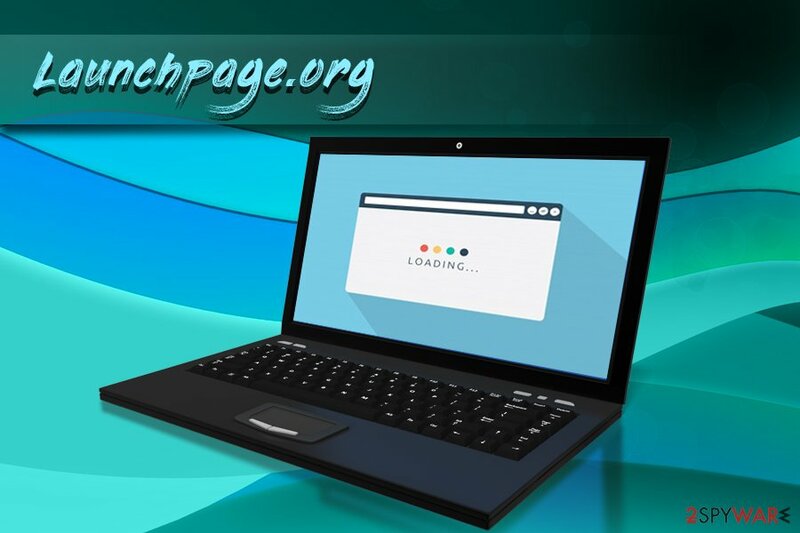 However, searching with the help of Launchpage.org is not recommended as its search results can be filled with sponsored links to third party websites. Researcher shows how Launchpage.org site looks like. 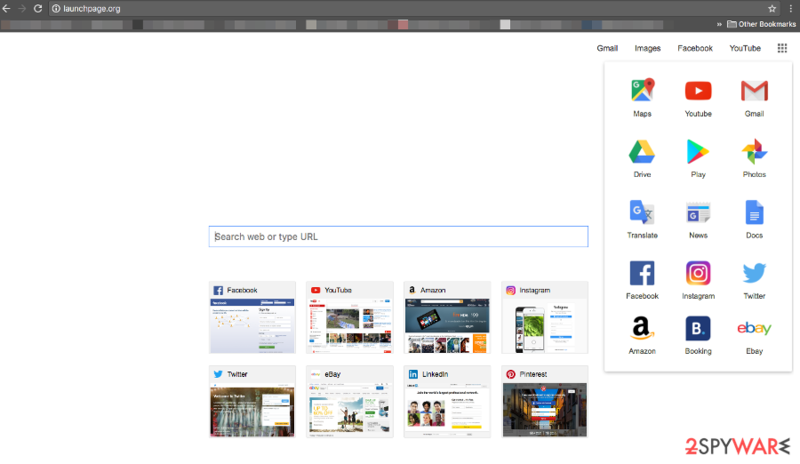 It looks almost identical to Google Chrome default homepage. As we mentioned earlier, the appearance of the bogus search site can trick Chrome people into using it, thinking that it is a safe-to-use search tool. Unfortunately, this mistake can lead to many problems. If you found this potentially unwanted application on your web browser, you should waste no time and remove Launchpage.org. So how launchpage.org removal process works? We highly recommend installing Reimage or other anti-malware/anti-spyware tool which is considered reliable to get rid of browser helper objects and similar components traveling together with this hijacker. According to the latest research data, this potentially unwanted program might be related to ilitil.com, teeion.com, zhinku.info, and similar browser hijackers. Thus, it might be hard to remove all suspicious entries manually. If you prefer manual elimination option, please follow our prepared step-by-step guide carefully. The main purpose of the browser hijackers is to generate revenue for the developers. Indeed, LaunchPage.org is free to use; thus, developers need another source of income and they choose online advertising. The so-called Launchpage virus might alter search results and replace organic links with sponsored ones. In this way, developers of this virus trick users clicking on third-party links that appear at the top positions of the search results. Often the owners of these websites want to increase their sales or boost traffic to their sites desperately. Meanwhile, users often need to browse through suspicious Internet sites where they might not find what they are looking for. Besides, some Launchpage.org redirect tendencies are worrying. Users might end up on malicious websites without realizing it. For instance, you might enter a tech support scam website or visit a corrupted site where scammers try their best to get your personal information. Thus, using this tool might be extremely dangerous. What is more, this potentially unwanted application might also deliver misleading third-party ads that offer to download suspicious software or warn about various computer-related issues. Be aware that these advertisements might include ransomware or other malware. Don't risk causing yourself more problems, and remove Launchpage.org from the machine today. Developers of browser hijackers such as Launchpage.org tend to rely on a very common infiltration method which requires bundling the potentially unwanted program with a freeware or shareware program. We believe that there are many computer users who have dealt with a suspicious search engine that appeared on their computer screen out of nowhere. Typically, the browser hijacker is pushed into the target machines by including it into a particular software package. Therefore, Launchpage.org hijack may have occurred when you were installing a single program and relied on Quick or Recommended setup. At this point, it was the moment you agreed to install all bundled additions. When installing freeware or shareware, no one tells you whether it’s a software bundle or not. You need to find out this information yourself. The only way to do it is to choose Custom/Advanced settings. Then, you need slowly and carefully follow each installation step and look for the list of pre-selected third-party apps. You might also find a statement where you agree to make Launch Page or another unknown search provider as your default homepage and search engine. It goes without saying that you must disagree with these agreements and reject all offers to install unknown browser extensions, rogue antivirus or PC optimization tools. They are barely useful and in most cases cause you problems. To prevent unnecessary problems, deselect these entries and protect your computer from PUPs. UPDATE June, 2017. After the virtual community had found out about the deceptive operations of one Chinese company that infected over 250 million computers with Fireball malware, 2-Spyware experts started hesitating whether Launchpage.org isn't related to the same malware as well. It may be true, especially when one of the main browser hijackers associated with the indicated malware are Trotux.com, LuckySearch123.com or StartPageing123.com. Although the relation between Fireball and LaunchPage isn't officially confirmed, we highly recommend you to take all actions to prevent further damage and scan your PC with a powerful anti-malware application. Open Firefox and access its Add-ons list. Here, you need to look through the list of installed browser add-ons and remove everything related to Launch Page virus. Clean browser shortcuts by erasing suspicious URLs added to the Target field. 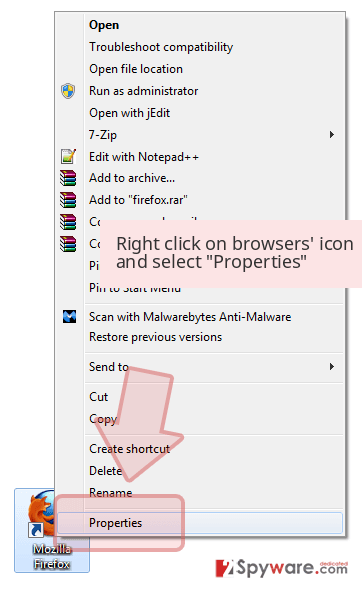 You can find this setting by right-clicking the shortcut and going to Properties > Shortcut. Check Windows Registry for modified keys that help to launch the annoying search site in Firefox browser. Check your LAN settings to see if the hijacker has altered them. 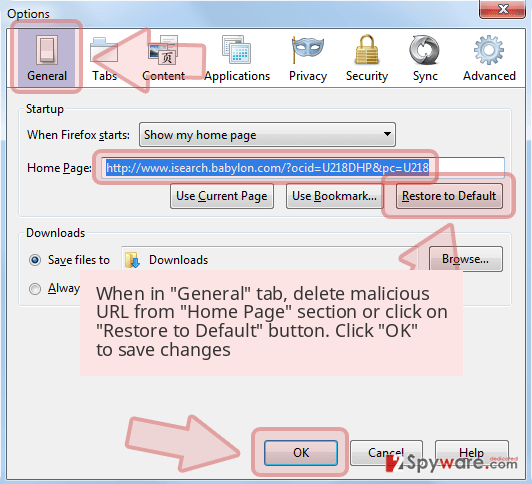 Scan your computer with anti-spyware or anti-malware to complete Launchpage.org Firefox removal. Press down Windows key + R. In the Run window, type regedit and press Enter. Now, Go to Edit>Find… and type launchpage.org or just launchpage in the search box. Search the registry for associated keys and delete them when found. Instructions for Chrome, Safari or Internet Explorer users are very similar. Besides, we provided some extra tips for Windows and Mac users. You can find all of them below the article. You have two options to initiate Launchpage.org removal. 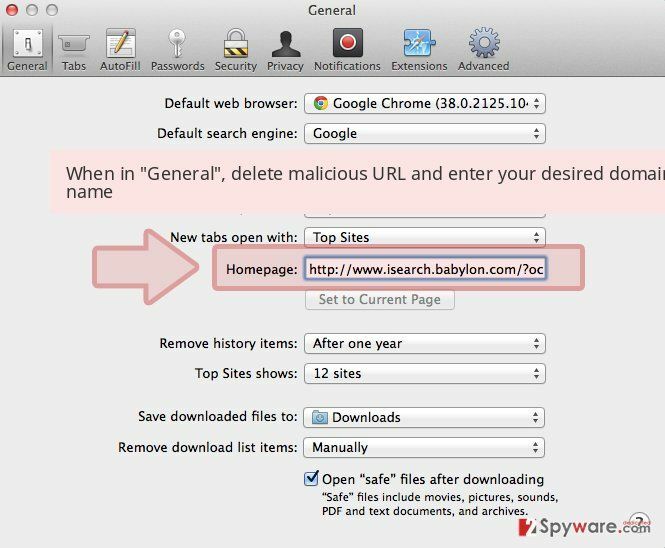 If this suspicious search engine hijacked your web browser, you shouldn't hesitate because it is a dangerous program to keep. We hope that you are not planning to let this hijacker stay on your computer because, obviously, such option can cause infiltration of serious malware, so it is not recommended. For Launchpage removal, we recommend scanning the computer with a reputable anti-malware program. This method assures that all potentially dangerous entries are eliminated from the system. Additionally, you can get rid of this cyber parasite manually by following our prepared instructions at the end of this article. Question. Launchpage.org search engine became my default one. I tried to switch it back to Google; though, it did not work. How can I get rid of it? Answer. This page has already become your default search engine because your browser has been hijacked. This browser hijacker might append arguments to various shortcuts and install helper objects to prevent users from settings their preferred search engine or start page address. Though, you should not use this search engine. Instead of that, you need to perform hijackers removal. You can find instructions how to do it below. Question. My computer was infected with this virus, and now I cannot browse the web normally. I cannot set Google as my default search engine; I am often redirected to questionable websites and see many online ads. Could you help me to get rid of these issues? Answer. Getting rid of these problems is possible. All you need to do is to remove this virus. Meanwhile, you need to be extremely careful when browsing the web. Avoid searching for information using this tool, immediately leave websites where you have been redirected and stay away from these ads. After clicking them, you might end up the infected sites or install malware. In order to remove the virus, we recommend scanning the computer with updated anti-malware program. It might be hard to detect all virus-related components and delete them from the system. Of course, you can try to do it manually, but please be careful and follow our prepared instructions. Question. I’ve tried deleting Launchpage.org from the Google Chrome. However, when I reboot my computer, it still shows up on my browser. How can I remove it entirely? Answer. Deleting this URL and setting your preferred one is not enough to get rid of the browser hijacker entirely. You will find full removal guidelines below. Please follow them carefully. Question. I installed PDF converter, and I was asked to make this search engine my default search site. I thought I would be able to switch to my regular search engine. Though, I was wrong. Now, I see not only this search engine but many suspicious alerts that my computer needs to be scanned for viruses. What should I do about them? Answer. When installing new programs, you should be more careful and do not agree to set any unknown search engine as your default one. What is more, you should also opt out all third-party applications that are offered to download as well. These additional programs are browser hijackers, adware and other potentially unwanted programs that should not be installed on the PC. These programs might alter browser’s settings and deliver misleading ads like the ones you have mentioned. Do not trust them and avoid clicking them. They might be malicious and offer to download bogus software. Therefore, now you need to remove Launchpage.org from the computer. We suggest scanning the computer with reputable anti-spyware. Scroll down to the detailed removal instructions. Question. My computer is infected with Launchpage.org virus. I am not sure what I am supposed to do now… Please help. Answer. We want to point out that this search engine is a potentially unwanted program and a browser hijacker. Thus, there’s no need to freak out; it cannot harm your computer’s system, steal personal data or encrypt files. However, it might increase the chances to encounter cyber infections that are capable of that. Hence, you need to remove this parasite from the computer immediately. The quickest and safest removal method is system scan with professional security software. Detailed explanation how to eliminate this potentially unwanted program is presented below. Follow the instructions provided here and delete programs associated with this hijacker from your PC. According to the latest news, this virus can be related to ilitil.com, teeion.com, zhinku.info, and similar browser hijackers. It goes without saying that you should uninstall these suspicious applications. IMPORTANT. 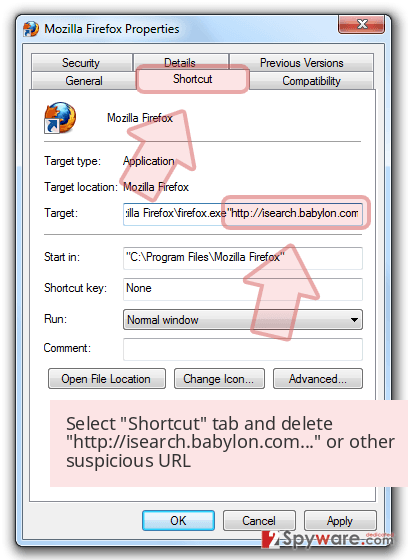 Do not skip the step where you need to fix compromised browser shortcuts. You must delete hxxp://launchpage.org from the Target field for absolute removal of this virtual threat. Don't forget to save changes! Additional thing that you must do is to ensure that your browser doesn't use automatic configuration script. According to the latest reports, computer users should also configure proxy settings because this malicious hijacker tends to corrupt them. To do this, open Control Panel, then go to Network and Internet, then to Internet Options. Here, go to Connections and open LAN settings. MAKE SURE that “Automatically detect settings” is selected. If the other two fields are filled with suspicious URLs, delete them! Finally, click OK to save. Press Windows key + R at the same time. Go to HKEY_CURRENT_USER>Software>Microsoft>Windows>Current version>Internet Settings. Here, find AutoConfigURL key. Delete it. Go to Edit>Find… and search for Launchpage.org. Here, look for Launchpage.org or any other recently installed suspicious programs. This browser hijacker can hardly affect Mac OS X. However, if you have experienced Launchpage.org hijack, please follow the instructions to get rid of it. When in the new window, check Delete personal settings and select Reset again to complete Launchpage.org removal. Follow the instructions to reset Microsoft Edge after the hijack. The Launchpage.org virus might have installed questionable entries without asking your permission. Thus, you need to delete these entries. Once these steps are finished, Launchpage.org should be removed from your Microsoft Edge browser. To remove Launchpage from Firefox, check the list of Firefox Extensions. Here, look for the unknown entries. If you find some extensions, plugins or add-ons installed to the Mozilla, uninstall them immediately. These third-party apps might be responsible for delivering an excessive amount of ads, tracking data or protecting this hijacker. Here, select Launchpage.org and other questionable plugins. Click Remove to delete these entries. Now you will see Reset Firefox to its default state message with Reset Firefox button. Click this button for several times and complete Launchpage.org removal. 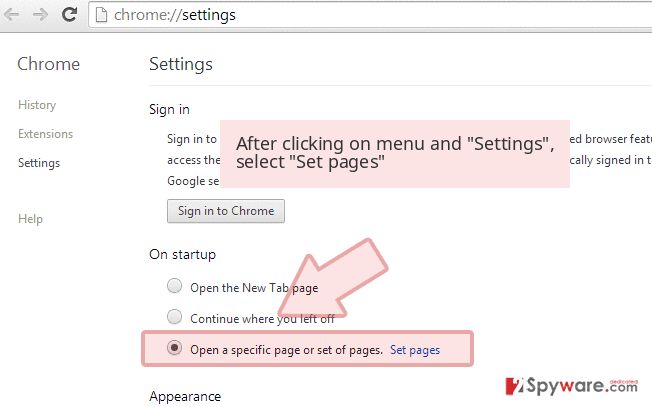 Open Chrome, access Settings and go to Extensions tab. If you can't find this panel, follow instructions with pictures below and you will definitely find it. 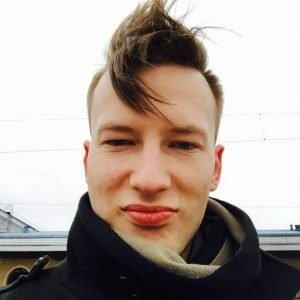 Remove suspicious extensions, including launchpage.org, ilitil.com, teeion.com, zhinku.info, etc. from here. You can also reset Chrome. Here, select Launchpage.org and other malicious plugins and select trash icon to delete these entries. Click Reset to confirm this action and complete Launchpage.org removal. Please, follow these steps to reset Safari after the hijack. ^ Larry Seltzer. How to Recognize a Browser Hijack. PC Magazine. Technology Product Reviews, News, Prices and Downloads. ^ Eliminate computer threats. Wubingdu. Spyware and security news in Chinese. ^ Potentially unwanted application (PUA). Sophos Threatsaurus. The AZ list of a-z of computer and data security threats. ^ The Basics of Browser Helper Objects. Microsoft TechNet Blogs. The latest information, insights, announcements, and news from Microsoft experts and IT professionals. ^ Mary Landesman. Top Online Scams. Lifewire. The website about technology. ^ Gadi Naveh. Malvertising: When Advertising Becomes Dangerous. Check Point Blog. The blog about online security and cyber threats. ^ Ugnius Kiguolis. Chinese company is responsible for infecting 250 million computers worldwide. 2-Spyware. Fighting against Spyware, Malware. This entry was posted on 2019-04-01 at 07:24 and is filed under Browser Hijackers, Viruses. How did you remove Launchpage.org virus?